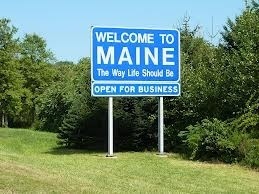 Maine – Made it! | Hey RV There Yet? Maine-ly, I no nothing about Maine……. – When I worked for a Boston company a lot of people would go to Maine for the weekend, or on vacation. All said it was beautiful. – the Appalachian Trails ends there (or begins) depending on your direction. We are Nobo’s (Northbounders), so the trail ends there for us. The plan: Eat lots of Lobsters, visit LL Bean, visit Acadia, and maybe stop by the end of the AT.